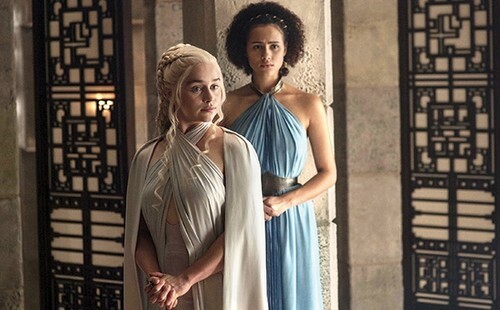 Daenerys Targaryen and Missandai Season 5. . Wallpaper and background images in the Daenerys Targaryen club tagged: photo game of thrones got tv show season 5 character daenerys targaryen dany mother of dragons stormborn khaleesi queen mereen missandai emilia clarke. 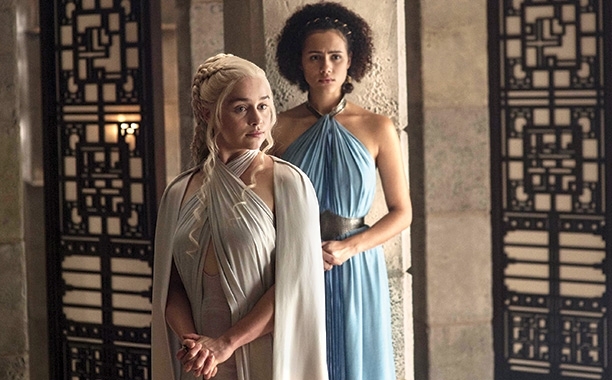 This Daenerys Targaryen photo might contain abito da cocktail, il fodero, abito da, segno, manifesto, testo, lavagna, poster, vestito da pranzo, abito cena,, abito da sera formale, vestito di cena, cena abito, formale, and abito da sera.